Could you introduce me a useful video converter to convert video files to any format and put video on any device with super fast speed and best video quality? Some people suggest me to download MacX Video Converter Pro, but I'm not clear about its functionality. Is there any available software review? Part 1: Why Is it Worthy of Recommending? Truth be told, one of the most depressed things is that your downloaded video or other videos can't fluently replay on your computer. Worse, you realize that it's impossible to watch video files formatted with AVI, FLV, MKV, MTS, etc on iPhone iPad iPod. Beyond all question, suchlike video format incompatibility questiones are widely present in our daily life. Of course, that is also why there are numerous video converting utilities on the market, and MacX Video Converter Pro is one of them. Perhaps you may be very puzzled about why should I choose it since you have no idea about it. In fact, it is a powerful video converter for Mac that can effortlessly and fast deal with any video format incompatibility issue by transcoding MKV to MP4, FLV to AVI, M2TS to MOV, etc. Additionally, this video converter for Mac is also an excellent online video downloader, screen recorder and slideshow maker. 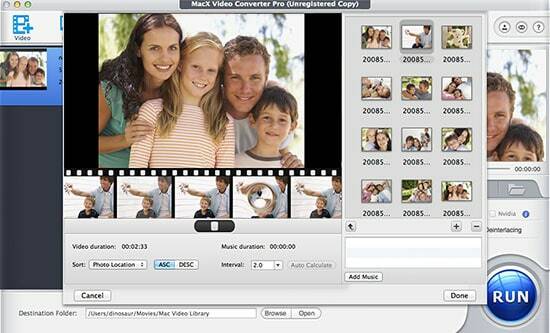 Prior to HD & SD video conversion, online video download and other tasks, users should download MacX Video Converter Pro (Windows version) and fire it up. Here, it is downloaded on my Mac computer (macOS Sierra (10.12); 4.0GHz quad-core Intel Core i7; 2TB Fusion Drive; Intel Iris Pro Graphics 6200). BTW, the minimum requirements of computer configuration are: 0.5G of CPU, 128MB of RAM and 100MB of HDD. Frankly, we always prefer the wizard-style interface. 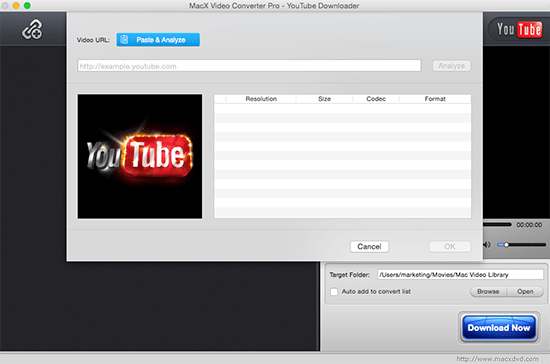 The main interface of this Mac video converter is intuitive, simple and uncluttered. To convert video, four simple steps are needed: add video to Mac video converter, choose the output format for your target video, select the destination folder to store the converted file and click "RUN" button to start. Moreover, batch conversion is supported. In the process of selecting output format, you can choose your desired video formats. Expectedly, the video processing software not only can convert videos to MP4, AVI, MPEG, FLV, MOV, WMV, MKV, MP3, etc due to its 370+ video/audio codecs, but also can convert video to 420+ readymade preset files for iPhone iPad Android Windows phones and tablets including iPhone Xs/Xs Max/XR/X/8/7/Plus, iPad Air 2, iPad Mini 4, iPad Pro, The new Apple TV, Samsung Galaxy S9, HTC 10, Suface Pro 4, Xperia Z5/Z4/C4/M4, PS4, etc for playback on the move. Certainly, users are allowed to personalize their video before tapping "RUN" button by using diversified video editing features. For example, cut/trim/merge video, add external subtitles and watermark, adjust video parameters (video codec, frame rate, resolution, bit rate, aspect ratio, audio codec), merge video, etc. In general, you needn't adjust these video parameters since the default video parameters are the best settings for high quality video output. And, you can select "Use High Quality Engine" and "Deinterlacing" options under the built-in video panel as the company claims they can improve the output image quality and it turns out to be true as per my test. In addition to supported video/audio formats, users will pay much attention to conversion speed because no one is willing to spend extra time on waiting for video conversion. Actually, this best video converter for Mac does a great job in video conversion speed and it is world's first video converter Mac that takes advantage of Intel Quick Sync Video to accelerate conversion speed up to 5X faster than other competitors. But, hardware encoding performance largely depends on your computer configuration. On my 4.0GHz quad-core Intel Core i7 Mac computer, I did a conversion test among 5 sought-after video converters. Apparently, after applying the Intel QSV hardware acceleration tech, the conversion speed is far beyond other Mac video conversion software and even surpasses some competitors as many as 5 times, while the other rivals spend much more time under the same parameter settings. That is to say, you needn't sacrifice video quality for faster conversion speed though this fastest video converter for Mac enables users to lower video quality during parameter adjustment process. MacX Video Converter Pro - flawlessly convert & compress 4K/HD/SD video to any video formats (MKV, MP4, MOV, etc.) and devices (iPhone 7/6S/SE, iPad Pro/mini 4, etc.) with 98% quality reserved. 5X faster speed than other converters. On the subject of output video quality, MacX has many words to say. It is capable of converting and even compressing the downloaded 8K/4K UHD 20160P/1080P HD samples, contents, videos, movies, clips and more to MP4, MKV, AVI, MOV, FLV, WMV etc with original quality reserved thanks to its built-in High Quality Engine. Furthermore, its editing function (trim, crop, merge, rotate, watermark, subtitle, etc) will further reduce the large 4K video file size to 70% smallar. To better know its output video quality, I tested four main video converters as below. iMac ( OS X Yosemite); 2.7GHz Intel Core i5; 8GB 1333 MHz DDR3; AMD Radeon HD 6670M 512 MB. Notably, MacX achieves the best balance between output video size and quality. Though Kigo video converter can get the smallest size video output, it owns the blurriest image. 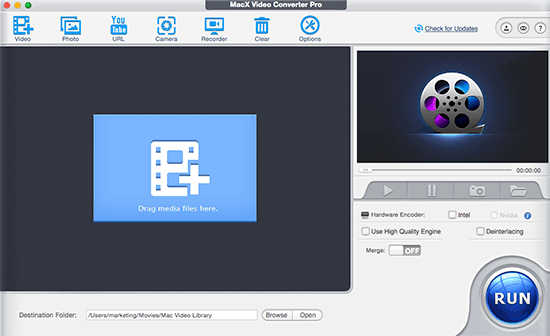 In short, ultra-fast conversion speed, high quality video output and abandent video/audio formats support are the main features of MacX Video Converter Pro. But, it doesn't support audio conversion and video burning as other video converters always do. In this information age, downloading videos from internet already becomes an indispensable part in people's life. Of course, the reasons are multitudinous including playing on the move, enjoying without Wi-Fi, sharing with friends, editing for uploading to social network sites and more. Based on these, online video download support is the essential element for common video converters for Mac, and MacX is no exception. To download youtube video, we can tap the "YouTube" icon on the user interface and a new box will pop out which is used to add wanted video URL. According to its description, MacX is able to download online videos and music from 1000+ video sharing sites like Facebook, Yahoo, Dailymotion, Vimeo, Vevo, Metacafe, Myspace and many more. Besides, even though you use the unregistered version, you also can use it to download online videos since this service is totally free. To test its capability of video download, I pasted 2 min 25 sec Official Trailer YouTube URL on the address box and found that it only needs 1 minute to load video information (resolution, size, codec and format). And then you can feel free to choose video resolution (1920 x 798, 1280 x 532, 640 x 266, etc), size (33.84MB, 25.86MB, 19.00MB and 14.63MB), codec (webm, mp4 and 3gp) and format (webm, mp4 and 3gp). I choosed 1920 x 798 33.84MB MP4 video to download and the whole download process spend 2 min. PS. The download speed relies on your internet speed. Honestly, when it comes to YouTube video download tool, there is no distinct difference between MacX Video Converter Pro and other YouTube download plug-ins or add-ons. But don't forget the other 1000+ sites support. No virus, ads, spams, etc. "I wanna make a stylish slideshow to display my cute 2 years old daughter's photo in front of audience in her birthday party. It's better that I can insert some audio tracks into it as background music.Can you tell me an usable slideshow maker?" As a matter of fact, MacX is also a stunning slideshow maker. For the sake of creating vivid slideshow for various ceremonies, you can click "add photos" button and select the entire folder on your computer (please adjust pictures order depending on your needs.). And the supported input photo formats contain JPG, PNG and BMP. Likewise, choose the output format for desired slideshow video in order to replay on computer, iPhone, iPad, Android, etc. Then hit "Edit" button and the pop-up box lists some useful functions for users to make personalized slideshow video (rename the output file, add/delete images, add background music, etc). Finally, click "RUN" button to start conversion. 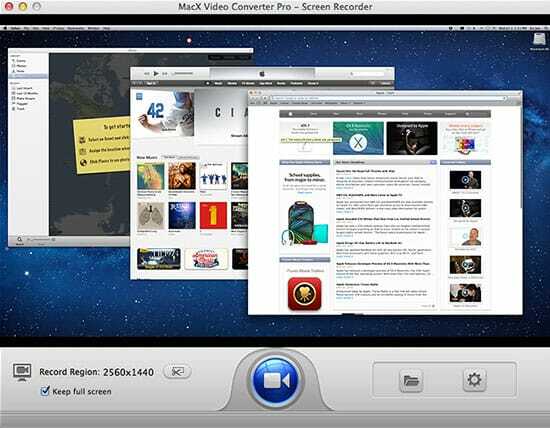 Last but not the least, MacX Video Converter Pro also can be used as a screen recorder for Mac to readily record screen activities taking place on your Mac computer. Simple steps as below: tap the "Screen Recorder" button on the main interface -> adjust capture settings -> choose the output folder -> click "Record" button to start. Cons: The goal of recording screen activities can't be achieved on Windows computer since this function is especially designed for Mac users. If you are a Windows user and desire to record game walkthrough, you have to figure out other app. To top it all off, there are many free apps available to record video. Crack version is everywhere in Google, but they are the older 2016 version. Now, here gives you the 2017 official MacX Video Converter Pro license code for you to convert video on Mac without any virus and danger. Top online video compressor tools are gathered to help you select the best online video file compressor to compress video movie online of MP4, AVI, MKV, MOV, AVCHD, etc. with no quality loss. The 2017 best free video downloader MacX YouTube Downloader is warmly welcomed by millions of users. As for new fans, they don't know too much about this Mac YouTube downloader. So here comes the review of MacX YouTube Downloader, hoping it useful to you.